The Shimotsuke Ten and the Shimotsuke Mai are the rods used by Katsutoshi Amano (known in the US primarily for his Amano Kebari). They are premium Japanese tenkara rods that are actually made in Japan. Shimano rods are made in Indonesia and the Daiwa rods are made in China. Both are 3.8m (12.5') rods. The collapsed length is 23 3/8" and they only weigh 2.5 ounces, which is light for a rod of this length. The Ten is 99% carbon and the Mai is 92% carbon. The grip has a fairly aggressive shape that provides two very comfortable positions to hold the rod. Also, the two positions have different diameters, so the rods are comfortable for people with large hands and also for people with small hands. 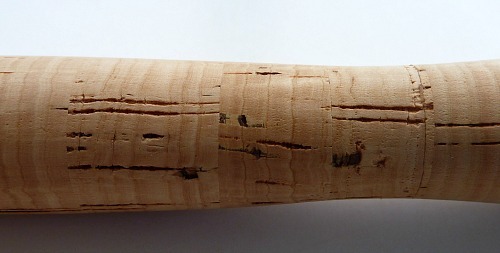 Unlike any other rod that I know of, there is no attempt to hide the imperfections in the cork with filler. I do not find the grip to be any less comfortable or any less non-skid. If anything, it is even more attractive, and leaving the natural imperfections is a very Japanese approach - wabi sabi - the Japanese cultural appreciation of the imperfect and the impermanent. Detail of the hand painting at the end of the sections on the Ten. On the Mai, the background color is red rather than green. I find it interesting that the action of the rods is not rated by the common but inconsistent 5:5, 6:4, etc. system generally used for tenkara rods. Shimotsuke has chosen to use the system that describes seiryu and keiryu rods. The Ten is a 硬中調 while the Mai is a 中硬調. Both are soft rods (the Mai is softer and more mid-flex) but neither has the soft tip that most tenkara rods have. Although the tips are solid rather than hollow, their bend profile is very much like that of a hollow tipped rod designed for level lines. The Mai is a 17 penny rod and the Ten is a 20 penny rod, which may seem a bit high for a soft rod but is explained by the relatively stiffer tip. I have used only level lines with the Ten and Mai, and although I have fished the softer Mai with a size 2 level line, a size 3 is a better match for the rod. I know that Amano-san fishes only an unweighted sakasa kebari, which is just what I would recommend with these rods. I don't keep the Ten or Mai in stock, but I can order one for you. Prices will vary with the yen/dollar exchange rate. Please request a quote if interested. Fishing this rod [the Ten] is a real pleasure. It is mid-flex with great rod loading, even with a light line such as a #3. The rod will cast with all weights of level line, but I prefer a #3-3.5. I have not used a furled line with this rod as I normally don't fish furled lines. The casting stroke is smooth and unlabored. There is no appreciable tip oscillation and the rod has excellent dampening at the end of a cast. Targeting is very controlled and excellent when using a light line. The cantilever effect is very minimal; not even slight hint of tip heaviness. Fighting fish is fun with this rod. Although it is a "mid-flex" rod, it flexes all the way to the handle with a 12 inch trout in a brisk current. This is true tenkara fish size. The Ten is one of my most favorite rods. It's a different rod dynamically than my other rods (flexible mid section with a stiff tip, versus a flexible tip and stiffer mid section as are most other rods). I really like it though. It's a hidden gem.